Russia is a powerful country. Historically it chose to be an icebreaker in the sea of world communication. And this is its mission indeed. To be an icebreaker it needs to be firm but flexible not to be dissolved or broken or flushed away by the waves of the Universe. Development of the new information technologies and mass media today makes new ways and means of interaction between state management, business and society possible. The only possible way to get to the new level of state management is by providing realistic feedback from the citizens of the country. The population should be informed about all the ongoing changes not only on the federal level, but also on the level of the local administration. And this new level could be called “Trust Strategy”. The outcome of the system of strategic planning is a development strategy clear for entrepreneurs and individuals. As a result, we can get an effective government capable of setting the goals and fulfilling them, being short or long term ones, also holding a public speech on their performance. Moreover, it should be possible for active population, small and medium-size enterprises be initiative and complete their projects, provided they are supported by the society. This also could be a factor to become an active member in the process of all the changes happening on the local level or in the country as a whole. I got interested in the idea to create a digital platform enabling cooperation of business, administration and society during the meeting with Vladimir Putin, the president of the Russian Federation, in March 2015. We presented our project “Construction Search”, which enables the construction industry of the Russian Federation search for new scope of work and make the whole industry “transparent”. During our talk with Mr President we were discussing a possibility to come back to the state planning in a new form by using the most modern technologies in communication which would digitize the country development plans and therefore get an immediate administration feedback on what is going. Mr President stated the necessity for creating domestic digital platforms, compatible with the global information space. It is a totally new form of the state management. It is also an effective socio-economical and space model of development of Russia. With the time the president’s idea has been developing and now we have a digital product. 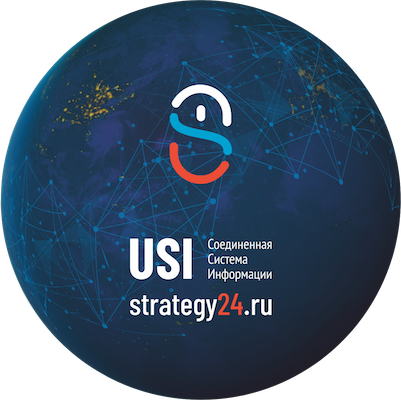 The digital platform, created by our company “USI” is a new standard of cooperation based on the most modern means of communication, incorporating several constituents such as “Construction Search”, “Strategy of the Russian Federation”, “Construction of the Russian Federation”. There has always been a problem of communication between entrepreneurs and administration aiming at reaching a mutual goal of the socio-economical development of the Russian Federation. This unique online-platform solves this problem effectively. 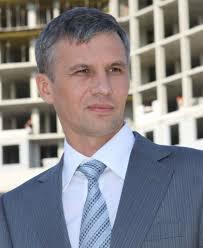 The level of development of the digital technologies of the Russian Federation makes it possible to state and fulfill the following targets: to put all information resources of the country together, to unite the needs of the entrepreneurs, authorities and society, to create the good environment to speed up the economical growth. This will make the work of administration at all levels clear and transparent to people, it will be possible to track demand and supply reaction of the population online. USI platform holds big complex data, able to fulfill new quality targets, with a prospective for future ‘smooth’ inter-regional, or even inter-state cooperation in the nearest future. I am convinced that very soon websites and web portal will disappear, they will be replaced by digital platforms which will provide goods and services, searched by individual users and companies. The digital platform designed by USI can collect and process big quantities of data from different sources in order to raise efficiency of the governmental decision making processes. The USI project puts this process up to the new level of the cooperation online in the following models: “business – government”, “business – business”, “business – society”. USI systematized all data on federal laws #44 and #223 followed by all construction customers, design engineers and contractors all over the country. 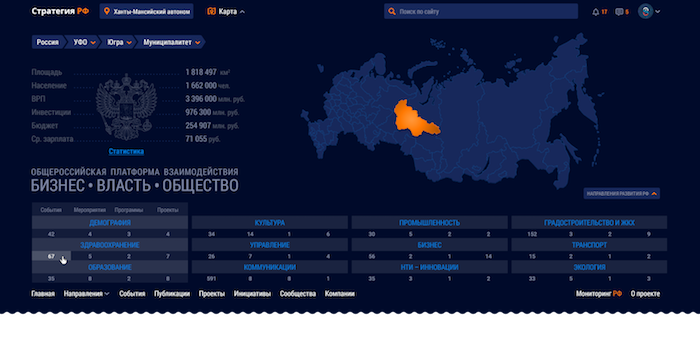 After signing in the user gets access to the whole data base on the web portal “Strategy of the Russian Federation”. The user can participate in elections, air their opinion on the governmental or other business projects, create groups, attract other users to promote their ideas, initiatives at all governmental levels and throughout the whole Russian Federation. Also a user can create a company, promoting ideas, goods and services, arranging cooperation and a bond between government, business and a customer. One of the main conditions is no anonymousness. According to the federal law # 172 all strategical planning data of all sub-federal units of the Russian Federation are collected and systemized on the web portal Strategy of the Russian Federation. This data makes it possible to say if the strategical planning papers are realistic, to set parameters for a target, to give prognosis for governmental programs, which are subsidized from the federal, regional or municipal budgets. Actually the aim of the company is to put all the data together and to look at the strategical planning processes and the presidential May order happening in the country as if you were an entrepreneur. It is important to attract both business elite and society for strategical planning, the main condition being publicity. At the present moment the webportal provides contact with the Ministry of the Economical Development of the Russian Federation, we signed some agreements for cooperation with the Khanti-Mansi autonomous okrug – Ugra government, authorities of the Surgut region and some other local administrations of Ugra, with the all-Russian non-governmental organization “Investment Russia”, the construction committee “Support of Russia” and others. As a result of many negotiations we have already set some successful pilot projects. Some planning, prognosis and performance results are being automatized, which enables easy online contacting anybody for discussion of the current or new laws and regulations. 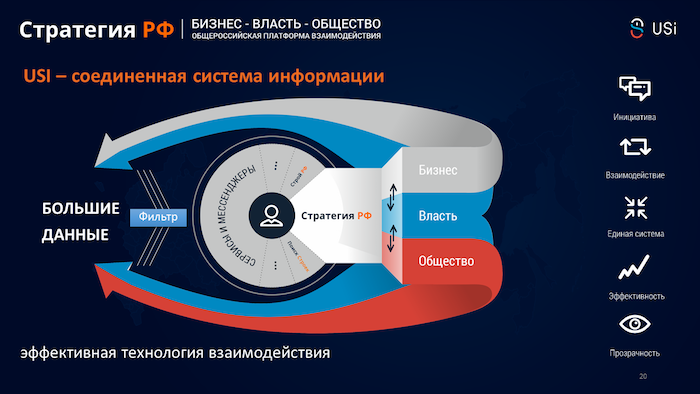 The communication on the Strategy of the Russian Federation web portal is possible with the help of a messenger and social network which attracts a large amount of entrepreneurs and citizens of Russia. Using this approach, we carried out new monitoring of the implementation of targeting models of the business environment changes analysis on the sub regional level. We also created services to monitor a project “Business Climate Transformations” which changes the federal law system attracting a large amount of experts and entrepreneurs from all over Russia. Our webportal is ready to perform in all sub regional units of the Russian Federation. The results of our activity have already been noted by federal authorities. We received expertise and financing from the Fund of internet-initiatives development. The model of strategical development system, fully functioning in Surgut, has been approved by Agency for Strategic Initiatives. Our digital platform becomes more and more popular in Russia, as its users are not only municipal, regional and federal authorities but also non-governmental organizations. One of the USI projects (Support Expert) was selected at a competition of unique IT-decisions in Russia and was accelerated at Skolkovo innovation center. The project aims to organize cooperation of the members of the “Support of Russia” (450 000 people) in the nearest future, aiming at making cooperation of all business community of the Russian Federation and other non-governmental organizations. So we see the platform as the largest and most active functioning business network in the world. Its advantages are a strong professional team with experience of creating an innovative product, no competition, flexibility and adaptivity to adjust to different demands, active support by the head of “Support of Russia”. An important goal of the state policy is the economical independence reinforcement and investment potential of the subregional units. It is especially important today to involve the potential of the entrepreneur initiative in the regions. The people need a strategy which would combine variety of interests, reached through mutual agreement. High involvement of citizens and entrepreneurs is the key to success! Russia needs a boat to reach the goal, Russia needs a future with correct coordinates. In other words, strategy is a path from A to the wishful B with some difficulties on the way. The outcome of the system of strategic planning is a development strategy clear for enterprises and individuals. As a result we can get an effective government capable of setting the goals and fulfilling them, being short or long term ones, also holding a public speech on their performance. Moreover, it should be possible for active population, small and medium-size enterprises be initiative and complete their projects, provided they are supported by the society. Municipal level can and should become the source of new decisions in demand under new economical conditions in spheres of entrepreneurship, investment and innovations. To reach this goal all constituents of the economical life of municipalities i.e. authorities, entrepreneurs, non-commercial organizations, regular citizens, should have common aims, a chance to act together, exchange best practices and experience. Our online platform can be a modern version the former State Plan (GosPlan), as a means for the authorities to publish, discuss and react to social and entrepreneur initiatives. The built-in network will provide communication and cooperation between authorities, businesses and society. Control and monitoring the municipalities development plans execution would lead us from planning strategies to “Trust Strtategies”. Our unique crowdsourcing platform on the regional level will bring the projects and initiatives to their final stage of implementation. All-Russian platform will enable all Russian regions exchange experience systematically. When we are working on such an important issue as development of Russia, it is vital not to just start a campaign but also make it work. Quite often businessmen discuss rumors about governmental pseudo projects, regulations, or sanctions. They do not trust any changes; they are not convinced of their consistency. To attract people to strategic planning and projects authorities should value individuality. Individuality here means that a state, town-hall, family – any entity excluding individuality – should serve an individuum, only in this case they would be appreciated, valued and needed. If authorities accept this idea as a value, they will see society as a participant (not the object) of the changes in the country. We can build a “STRATEGY OF TRUST” only by uniting intellectual professional administrators and regular citizens. Such cooperation will be more effective rather than single administrative decisions. Each generation has CHOICE. Don’t be afraid to set an ambitious long-term strategical target, e.g. Let our children and grandchildren devote their lives to Russia! This is the only way to win minds, keeping and developing them, applying all outer means in the name of Russia. It may take decades, but it is well worth all the tremendous effort.